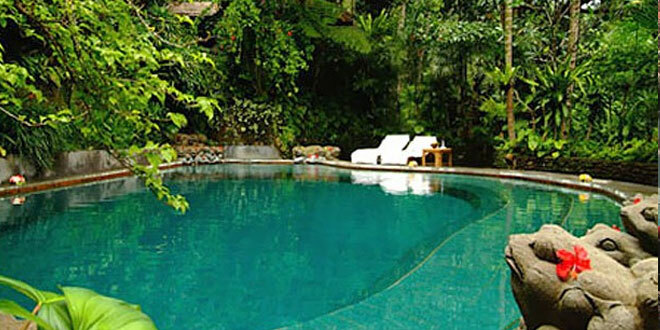 Tjampuhan Resort, located near the traditional village arts and cultural center of Ubud is the epitome of luxury. To accommodate the leisure and recreation needs of the guests’, the tjampuhan resort has created a unique program of actives to make each stay a truly enriching Balinese experience with many memories to take home. The hourly shuttle bus into the town of Ubud provides guests with the chance to catch cultural dance performances. The Balienese architecture and hospitality combine in making the setting of the resort and spa truly inspirational. At the Terrace Bar and Restaurant, Western, Asian, and Balinese specialties are available throughout the day. The Spa Cafe offers snacks & special afternoon teas. Drinks are served at the Pool Bar over-looking the valley and a choice of films are on show daily at the Movie Lounge. A unique grotto setting decorated with traditional carvings & stonework is set into the river valley. Offering hot and cold whirlpool baths, sauna & steam rooms, a program of health treatments is available for guests, including: traditional Balinese, Swedish & Acupressure massage.